If I understand this “Anything Goes”, as long as it is Wings Theme. I had some free time today as my drywall mud is not drying due to all the rain. So I thought I would give the “Wings Challenge” a try. 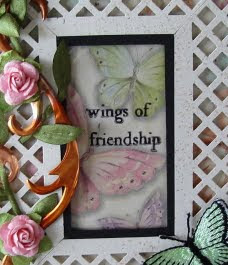 Please check http://gingersnapcreations.blogspot.com/ for this challenge. 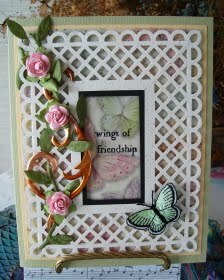 I’m playing with a Martha Stewart punch (called Garden Trellis and Right angles). Or what they call a 45-degree angle. Call Me Nuts!!! But it was fun to do. Using regular CS cut strips 1-½ inches wide by 11 inches long. You will need 2 strips. You will need to trim the straight edge to ¼” to make sure they call met in the center. 5 ½ x 4 ¼ cardstock. Tape angles together with 1/8” clear tape. The foam tape is also cut the same for mounting.I used printed butterfly paper as my background panel. Using Tim Holtz’s new large die to cut the copper sheeting, and burning it to get the color. My stamp is from Betsy Griffin at ISC. Thanks so much for stopping in today. Hope you are dry and well. This is so beautiful!! Great job with the Martha punches - I have trouble getting my corners right, even with the corner punches, LOL!! I love the T!m swirl in copper - what a fab idea. I will definitely have to try that! Thanks for playing along in the Gingersnap challenge, too! Oh Vada, this is just beautiful. I love the soft colors and the touch of copper is great! Love this!! really pretty, a very special creation. Stunning!! Is 100 degrees dry enough?? Gorgeous! Thanks for playing the Gingersnap Creations Wings Challenge!